Are you a writer who loves short stories? Do you enjoy short stories but happen to know a writer who wants to send his or her work out to different markets? Either way, our three ebook bundle is perfect for you! In this bundle, you’ll get three ebooks normally valued at $4.99 for a special price of $2.99! 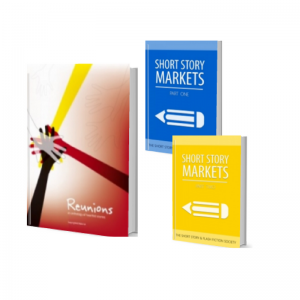 The ebooks included in this bundle are Reunions, Short Story Markets Vol. 1, and Short Story Markets Vol. 2. Reunions is an anthology of heartfelt short stories about various reunions. Romantic reunions, friendly reunions, family reunions, all promise to trigger deep and intense emotions and keep you good company! It’s a great quick read for the fan of short stories. Short Story Markets Vol. 1 gives you over thirty unique publications to submit your masterpieces to, and Short Story Markets Vol. 2 gives you thirty more! Includes all types of genres and convenient links for the writer to refer to. This bundle is a great gift or resource to keep in your own library!